While I can't confirm it's the best one ever written, this book is a great tool on how to properly use common punctuation marks—such as commas, semi-colons, and quotation marks—and less-common ones—such as standard dashes, em-dashes, and ellipses. 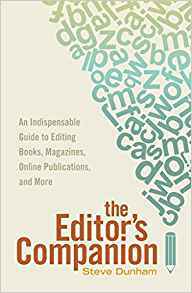 As the appropriately mis-worded title implies, this book is a great desk reference that can help correct several common grammar mistakes that the average writer or editor might not have a clue are even mistakes. Like any good instructional book, it not only tells you that it's wrong, but goes into why it's wrong. While this title does contain a lot of info not super relevant to fiction writers, it contains a lot more info that is. It's probably not a great desk reference since there is just so much information, but while it does point out some grammar and punctuation issues, it also goes into understanding your market and how to incorporate that into your edits; how to create and use extremely helpful tools, such as style sheets; and mentions a lot more helpful titles and when to use them. This all ends with a section on some very hilarious typos in national venues, like newspapers and magazine headlines.